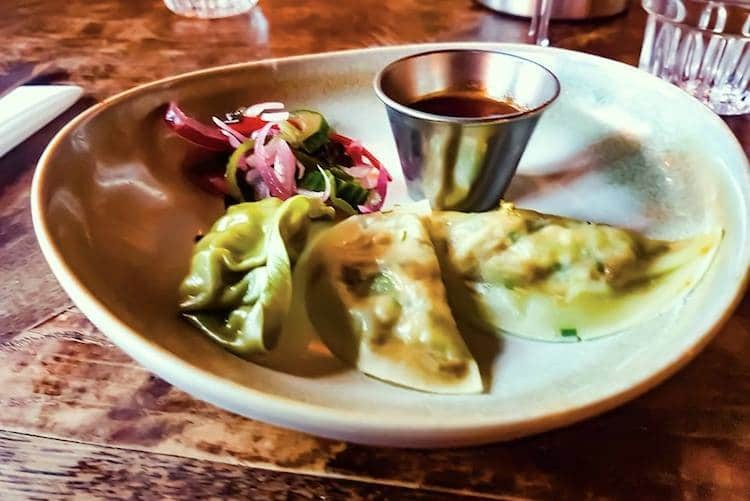 The Walrus Supper Club, Vegan Review. 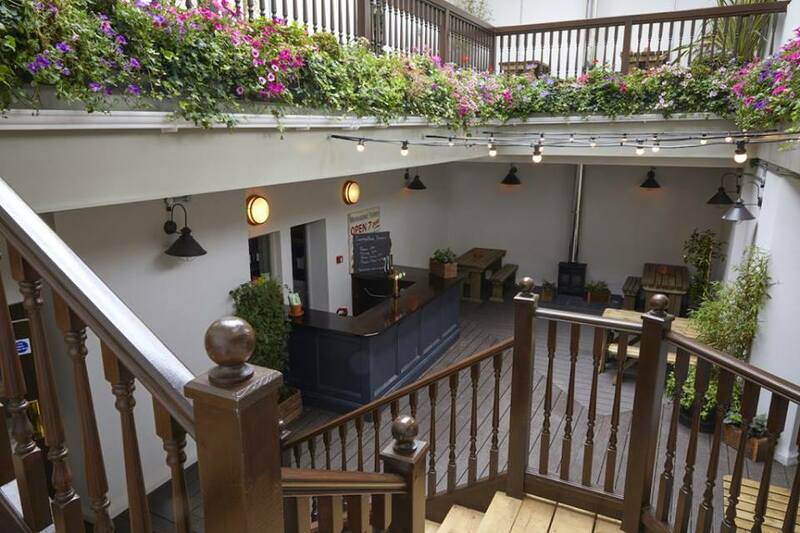 The Walrus pub is a sprawling beast of a venue, extending grandly in height and depth, boasting a night club in its belly and a garden on its head. 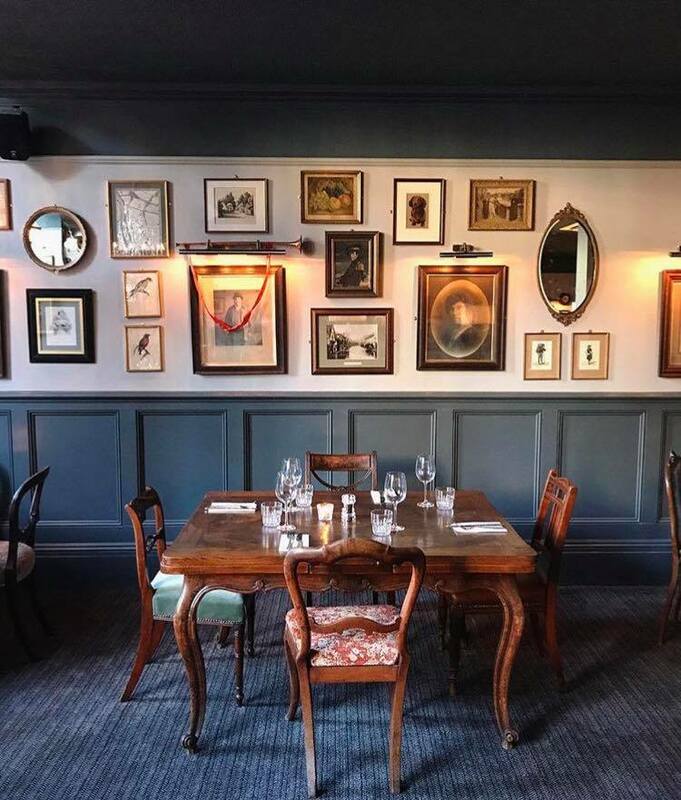 The main bar and restaurant is decorated in Victorian gloom whilst a closer inspection reveals little quirks of humour here and there in the wall pictures and ornament. 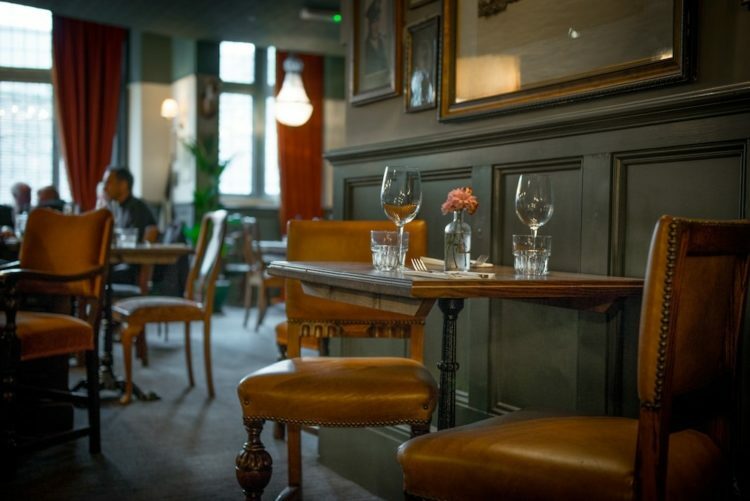 The labyrinthine bar allows for the sizeable venue to still be personable, find a booth or a nook for a few friends, or come with your clan and claim one of the open plan areas. 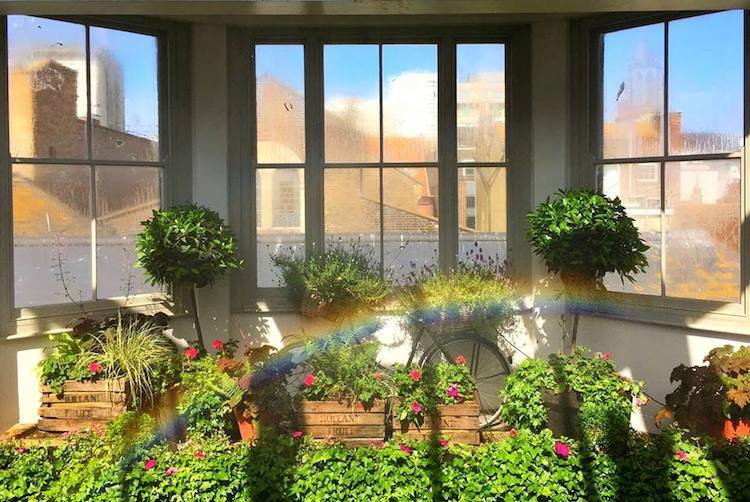 In warmer seasons the two tier roof terrace is a great find, shielded from wind but not the sun, it is one of those outdoor-indoor spaces that is at once a conservatory and a beer garden. The Walrus supper clubs run throughout the month, one meat, one fish and one bucking the growing national movement toward veganism. Offering a set menu with selected drinks, a supper club is like cooperative dining, everyone benefits from overheads that are lower, no wastage, and as is being seen more and more, less choice is the accepted compromise for better quality. Our party of four hungry vegans were seated at a large dining table in the main restaurant. 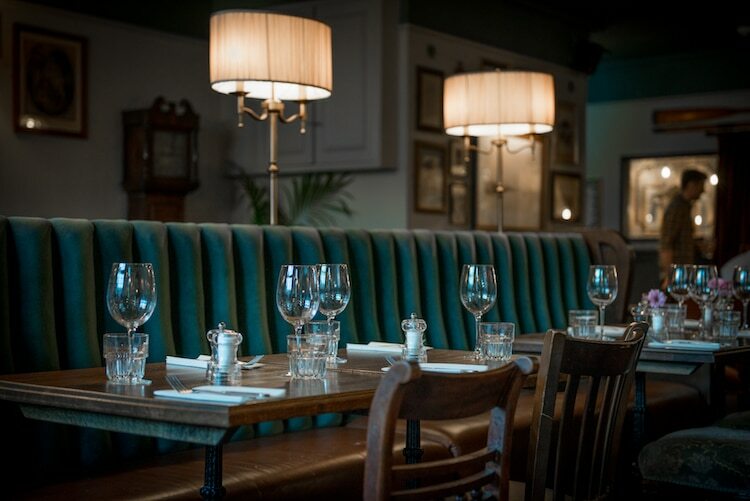 Unlike the bar below the restaurant is open plan, but continues the decor in Victorian green, vintage photography and paintings hung salon style, and dark wood. Plenty of light is added by candles, the large windows and soft lighting, creating a comfortable and refined ambiance. A set menu also means you don’t have to worry about navigating the perils of food jealousy, or ordering a starter that transpires to be too much like your main, or the one-hundred-and-one other dangers that may beset man on his quest for food. Instead we settle for a cursory reminder of a menu long advertised and get on with conversation. We order a bottle of Trebbiano Rubicone, which we’ll get a glass of anyway as part of our meal, but not for a bit, it’s a light fruity wine, easily quaffable. The room by now has filled with the excited chatter of expectant diners. Mostly, like us, tables are small groups of four or six, there are a couple of large parties and one or two couples, most it seems take the word ‘club’ to imply something social, my friend Neil points out it also implies exclusivity, something most of us like to belong to. The first course arrives, leek and tofu dumplings with chilli jam. Here again is the benefit of a supper club, as soon as the kitchen doors open a stream of servers come out and everyone is presented with food in moments, no rubber necking or impatient bobbing in chairs needed. Chatter turns to clatter as attention turns to cutlery and for a few minutes the room is just a hush of tasting before slowly picking up conversation once again, almost exclusively about the starter. 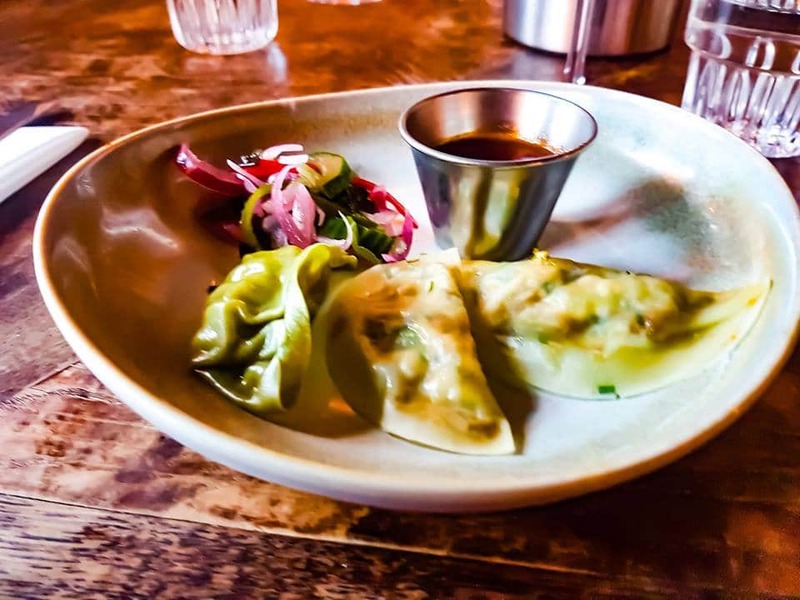 The gyoza are served with seaweed and samphire salad which elevate the dumplings perfectly, the chilli jam is used sparingly in getting a little kick of sweet and heat bookending the savoury parcels. These are polished off fairly quickly and the collective tastebuds of our club are ready to really get stuck in. The second course follows together with the included glass of wine. We are presented with beetroot pancakes, generously filled with oyster mushrooms and cashew cream, topped with a rich tomato sauce and peppery rocket. 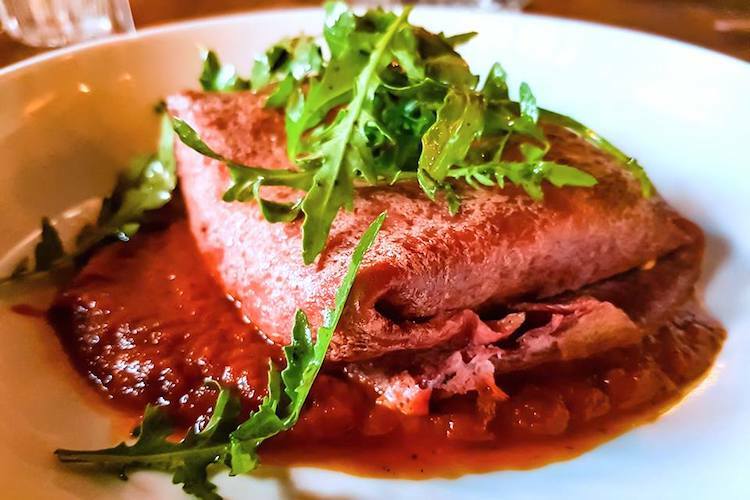 It’s an impressive looking dish with its pink pancake, deep red sauce and striking green leafy top. The pancake is a soft and light with the slightly sweet yet earthy taste of beet coming through, the filling has a deep meaty taste from the mushrooms, whose earthiness works well with the beetroot, and the cashew adds a creamy richness you would expect with a Breton crêpe. The tomato sauce is just tart enough to balance the flavours without being acidic, whilst the rocket keeps the pallet nice and fresh for the next mouthful. The whole being more than its parts, the dish works well, and despite our table having members who don’t like mushrooms and beetroots, all our plates are cleared. A little more time to chat and the room is in full swing, light from outside has dropped and the indoor lighting is brought up a little, but not so much as to scare away the intimate atmosphere. What is a really marked pleasure at this point is realising we are in quite a full venue, but we are not cramped, in fact no one appears to be jammed onto tables too small for their number. And whilst we are in a lot of company no tables impose on any others, a rare and fine balance has been achieved in The Walrus dining room. The third course arrives, a Caribbean curry with rice and peas, this is again a healthy portion with a mix of vegetables in a creamy coconut sauce with warm, not hot, spices. The rice and peas have a little cranberry through it for an added element of sharp-sweet. We have by this point already eaten a lot of good food, it’s incredible value for money. Our table agreed that both this dish and the pancake before it could have both been half the size and we’d of eaten plenty, but now we were having to exercise self restraint and turn away some food. The curry was rounded off with a Blue Moon white beer served with a slice of orange, fruity and quite floral and refreshingly cool, a very nice closer to the warmth of the curry. I was by this point beginning to worry that trouser buttons might start pinging off and ricochetting about the place, smashing glassware and upsetting pictures. The Walrus Supper Club should come with the an advisory warning to arrive hungry, but as the saying goes, ‘there’s always pudding room’, and I had a review to write and one last dish, the Summer Seaside Dessert Selection to try. 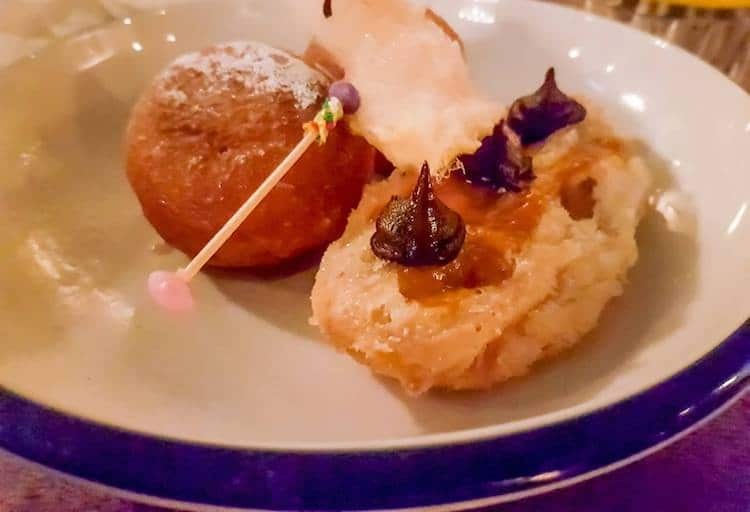 This seaside themed dessert was a playful nod to the kitsch consisting of two little doughnuts, a cocktail stick of candyfloss and a little crispy, flaky pastry boat with chocolate drop passengers. Thankfully the portion size was perfect and I neither exploded or had to turn any of it away. A final look round the room showed a very satisfied crowd, comfy now to sit back and digest amongst friends and, if room would allow, perhaps a few more drinks. 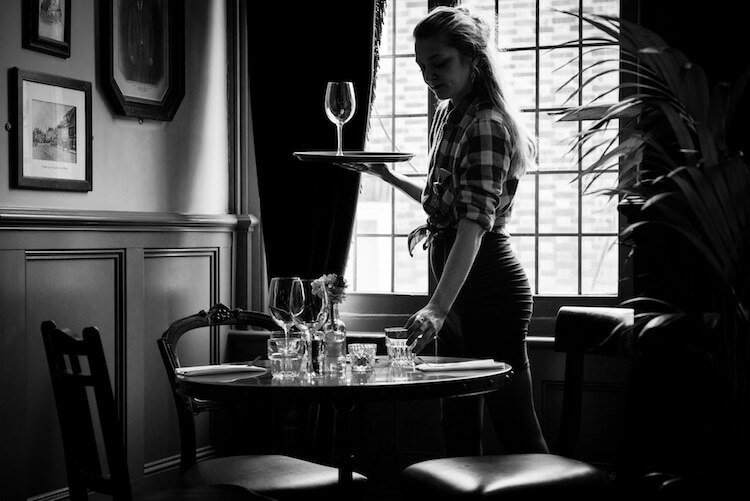 One of the problems faced by almost any pub, bar or restaurant these days is enticing a public away from insular worlds of social media, cheap supermarket alcohol and food delivery services out into the world at large. 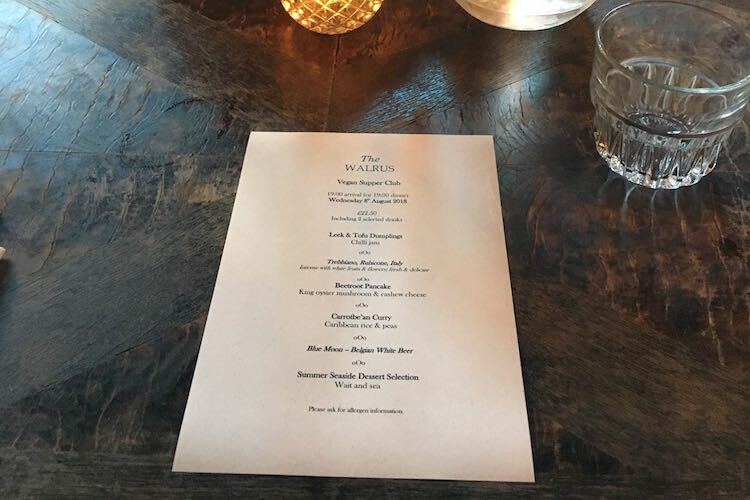 The regular supper clubs at The Walrus provide an excellent value for money way of spending a night out, and making any occasion a special, and most importantly a social one.